As Bob Dylan said, Don’t need a weatherman to know which way the wind blows, and the wind is blowing Man Utd’s way now. City have led since October, but been overtaken by the champions with ten games to go. There’s only one point in it, but I can’t see Utd blowing it, Alex Ferguson is too good for that. Much as it pains me, he is quite possibly the best manager ever. He has been here so many times before that to me it is almost inconceivable that he will blow it now he’s ahead. City by contrast don’t have that experience as a club, even if some of the individuals do. That makes a difference. Unfortunately there is too much of a gap to the rest of the chasers to involve anyone else in the race, and whatever Spurs might have thought it’s really been a two horse race almost since the start. Why am I telling you this? 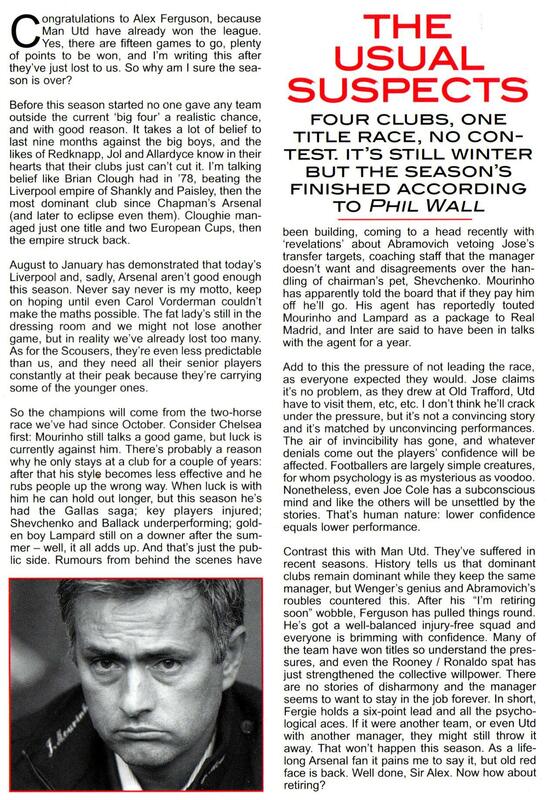 Firstly to put the prediction on record, and secondly as an excuse to post another on my old articles from The Gooner. I made the same prediction in January 2007 that Man Utd would end the season as Champions, when they were in a two horse race with Chelsea. (At the time, Liverpool were still considered one of the ‘Big 4’ – how times change.) I was right then, with almost four months of the season and 15 games to go, so surely I’m right this time, with only ten games left? Congratulations to Alex Ferguson, because Man Utd have already won the league. Yes, there are fifteen games to go, plenty of points to be won, and I’m writing this after they’ve just lost to us. So why am I sure the season is over? Before this season started no one gave any team outside the current ‘big four’ a realistic chance, and with good reason. It takes a lot of belief to last nine months against the big boys, and the likes of Redknapp, Jol and Allardyce know in their hearts that their clubs just can’t cut it. I’m talking belief like Brian Clough had in ’78, beating the Liverpool empire of Shankly and Paisley, then the most dominant club since Chapman’s Arsenal (and later to eclipse even them). Cloughie managed just one title and two European Cups, then the empire struck back. August to January has demonstrated that today’s Liverpool and, sadly, Arsenal aren’t good enough this season. Never say never is my motto, keep on hoping until even Carol Vorderman couldn’t make the maths possible. The fat lady’s still in the dressing room and we might not lose another game, but in reality we’ve already lost too many. As for the Scousers, they’re even less predictable than us, and they need all their senior players constantly at their peak because they’re carrying some of the younger ones. So the champions will come from the two-horse race we’ve had since October. Consider Chelsea first: Mourinho still talks a good game, but luck is currently against him. There’s probably a reason why he only stays at a club for a couple of years: after that his style becomes less effective and he rubs people up the wrong way. When luck is with him he can hold out longer, but this season he’s had the Gallas saga; key players injured; Shevchenko and Ballack underperforming; golden boy Lampard still on a downer after the summer – well, it all adds up. And that’s just the public side. Rumours from behind the scenes have been building, coming to a head recently with ‘revelations’ about Abramovich vetoing Jose’s transfer targets, coaching staff that the manager doesn’t want and disagreements over the handling of chairman’s pet, Shevchenko. Mourinho has apparently told the board that if they pay him off he’ll go. His agent has reportedly touted Mourinho and Lampard as a package to Real Madrid, and Inter are said to have been in talks with the agent for a year. Add to this the pressure of not leading the race, as everyone expected they would. Jose claims it’s no problem, as they drew at Old Trafford, Utd have to visit them, etc, etc. I don’t think he’ll crack under the pressure, but it’s not a convincing story and it’s matched by unconvincing performances. The air of invincibility has gone, and whatever denials come out the players’ confidence will be affected. Footballers are largely simple creatures, for whom psychology is as mysterious as voodoo. Nonetheless, even Joe Cole has a subconscious mind and like the others will be unsettled by the stories. That’s human nature: lower confidence equals lower performance. Contrast this with Man Utd. They’ve suffered in recent seasons. History tells us that dominant clubs remain dominant while they keep the same manager, but Wenger’s genius and Abramovich’s roubles countered this. After his “I’m retiring soon” wobble, Ferguson has pulled things round. He’s got a well-balanced injury-free squad and everyone is brimming with confidence. Many of the team have won titles so understand the pressures, and even the Rooney / Ronaldo spat has just strengthened the collective willpower. There are no stories of disharmony and the manager seems to want to stay in the job forever. In short, Fergie holds a six-point lead and all the psychological aces. If it were another team, or even Utd with another manager, they might still throw it away. That won’t happen this season. As a lifelong Arsenal fan it pains me to say it, but old red face is back. Well done, Sir Alex. Now how about retiring?